It’s almost the weeeeekend! I am so, so pumped you guys. Almost as pumped as this trashed up avo toast! Eddie was in England for over a week and let’s just say that those old years when he used to travel and I loved it are quiiiiite different than now, when we have a babe and he has to leave for an extended period of time. It’s been nearly ten days and I just kind of want to watch a random youtube beauty video in silence, you know? I mean, yes, it was extremely exhausting having Max 24/7 and working at the same time, but the biggest struggle I came across was dinner. Well – let me rephrase – it was by no means a struggle since we prep dinner every day to survive. But you might remember that when Eddie used to travel a few years ago, I had fabulous single girl dinners that consisted of cheese and crackers, assorted bowls of cereal and… glasses of wine. With more cheese and crackers. After 90 minutes of yoga. And then I’d watch hours of trash TV while I worked late into the night. Since we did some extra fun things over the last week to stay busy, I made a lot of quick dinners and used lots of leftovers. Eggs with buttery toast, quick pastas with roasted tomatoes and some assorted veggies on their last legs in the crisper drawer, maaaaybe only one plate of nachos and only one, thank goodness. Lots of avocado toast because both Max and I love it. LOTS. Take one look at my Instagram or crumbs section and it’s not tough to figure out that I’m the person who is STILL obsessed with avocado toast. It’s quick, it’s delicious, it’s easy, it’s customizable. I love love love it but there is just one thing: sometimes I need a little extra staying power. Do you know what I mean? This definitely depends on the type of bread I’m using and when I’m eating the toast (i.e. is it a snack? A full blown breakfast? After dinner eats? An emotional excuse to unwind? ), but if I’m considering it to be a meal, I want something a bit more satisfying. Which is why eight times out of ten, I add an egg (or two) on top. Seriously, that’s getting up there with combinations like chocolate and peanut butter or tomatoes and basil. Before we know it there will be an avocado-toast-with-eggs flavored lipgloss. While eggs are my favorite thing to add on top, I also love fresh tomatoes and goat cheese, bacon (um, hello, of course), tuna in olive oil with fresh herbs – I’ve even made an autumn version with pears and blue cheese! 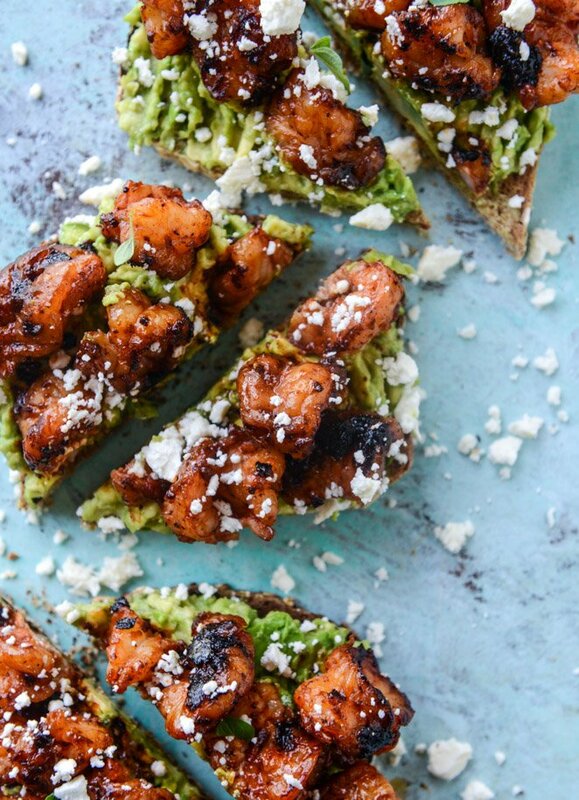 Perhaps my favorite summer version is this mexican grilled street corn avocado toast. UGH! So freaking good. So much flavor, texture and all around goodness. Let’s talk about THIS toast. When it comes to the toast, I don’t like the idea of actual guacamole on my toast – I don’t want onion or cilantro and lime mixed into the avocado and smashed on the toast. On a tortilla chip, always. On my toast, not really. But! I make an exception when it comes to this. Just a teeny hint of lime and lots of salt go into this smashed avocado. On top, we have some BBQ rubbed shrimp – I like to use the big, fat, grilling shrimp that are split down the center – sautéed in some butter which browns and takes the flavor to a whole new level. After that, we have a sprinkle of queso fresco cheese crumbles – refreshing and slightly creamy and oh-so good. I’m absolutely enamored with this meal – you could even make it on mini tortillas for an appetizer at a party. It’s light and refreshing but filling at the same. It only takes a few minutes to prepare so there is no excuse! Heat a large skillet over medium heat. Pat the shrimp completely dry with paper towels. In a bowl, whisk together the sugar, paprika, chili powder and onion powder. Sprinkle it evenly over the shrimp. Add the butter to the skillet. Once it’s sizzling, add in the shrimp and cook on both sides until pink. You can do this in batches if needed – you don’t want to overcrowd the pan. The butter will brown as the shrimp cooks and you can whisk it occasionally to prevent it from burning. When the shrimp is finished, stir in the garlic and BBQ sauce. Turn off the heat. In a bowl, mash the avocados with the salt, pepper and lime juice. Smash the avocado on the toast pieces evenly. Top the avocado with the shrimp. Sprinkle some of the queso fresco on the shrimp and cover with the herbs. Eat up! p.s. you wouldn’t believe how well this pairs with a margarita. it wasn’t too bad! a piece here or there would fall off but not as much as i thought – but i’m also used to piling lots of stuff on top of my avocado toast. :) you can have a knife and fork just in case! It’s always tough when the hubs is out of town. Mine has been in Shanghai on business since March. Let me tell you. . .I always look forward to his visits home because. . .well. . .numero uno, I get to see him. . . and two. . .I feel like I actually get a break from all the madness of running a household solo. Needless to say, I’m always on the look out for “single lady” meals. . .and often find that breakfast, lunch and dinner involves some sort of mashed avocado. But holy cannoli. . .that avocado toast topped with those succulent barbecued shrimp?!! Stop the presses. . .I need this in my paw. . .like ASAP. I’m usually a big winter lover (christmas, pumpkin spice, blankets etc..) but what really makes me enjoy summer is the food. The shrimp, grilled BBQ meat and party appetizers have always been what gets me out of my summer slump lol. I cannot wait to try these toasts!!! Staaaaaaahp it. You kill me every time something is “trashed up”. Can’t we just make everything trashed?! Oh. Em. Gee. This sounds amazing! I’m in! I made this for dinner tonight and it was AMAZING! 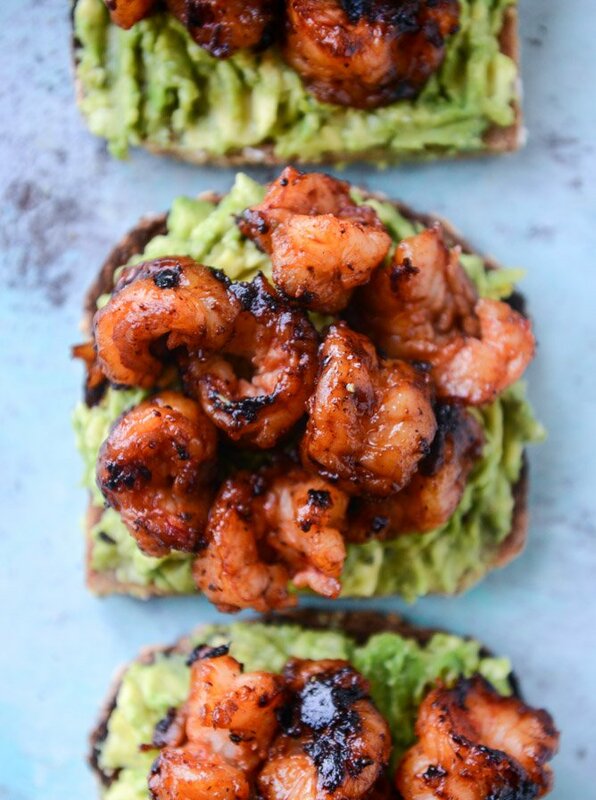 I am typically less than impressed with recipes I get from the net ~ but your BBQ Shrimp and Lime Avocado Toast is the best new dish I’ve made in a very long time ~ Thank You! What a great quick, light dinner or special lunch, maybe even cut into smaller triangles for a brunch. Ideas…. definitely will put this one to use. Thank you! The sauce for those shrimp looks outrageous…will try soon! My last payment was $8492 working 11 hours a week online. My sisters friend has been averaging 17k for months now and she works about 21 hours a week. I can’t believe how easy it was once I tried it outt. I made this into a flatbread using puff pastry in place of the toast. It was amazing!! !